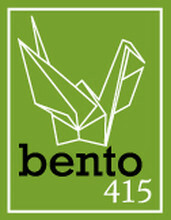 Bento 415 takes the Japanese concept of a "bento box" meal and fuses it with cuisines from around the world. Our bento boxes are named after San Francisco neighborhoods. We also serve breakfast bentos and share a retail location in Potrero Hill with Pinkie's Bakery.